In Madre del Dios, a remote region deep in the Peruvian rainforest, deforestation and mercury pollution from illegal gold mining threaten the health of the ecosystem and the local population. More than 300,000 hectares of rainforest (an area slightly larger than Rhode Island) have been devastated over the past 30 years and about 40 tons of mercury is dumped into the environment annually. But illegal mining provides vital economic support for about 60,000 people in one of Peru’s poorest regions. Students from the Harvard John A. Paulson School of Engineering and Applied Sciences(SEAS) and Universidad de Ingeniería y Tecnología (UTEC) tackled this complex problem with a unique solution—by developing a device to improve agriculture. Rice, corn, pineapples, and papayas are grown throughout the region, but agriculture in Madre del Dios is manual and uses outdated equipment, leading to high crop mortality rates. 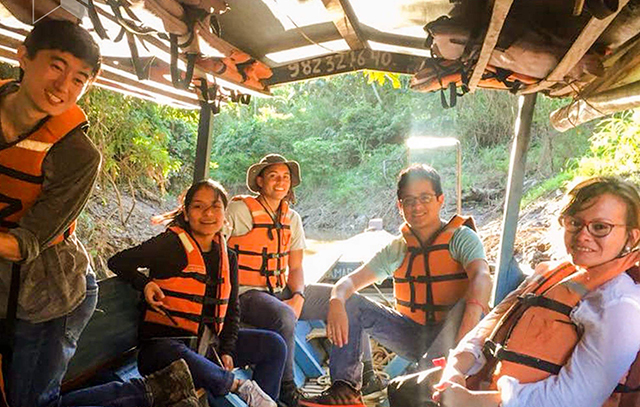 SEAS and UTEC students explore the remote region of Madre del Dios by boat, traveling down the Amazon River. Building off a project started by a group of students in January, Huggins and mechanical engineering concentrator Dennis Zhang, S.B. ’18, traveled to Lima in July to collaborate with UTEC peers on a soil-testing device. Funding from the U.S. State Department enabled program directors Joost Vlassak, Abbott and James Lawrence Professor of Materials Engineering, and UTEC engineering professor Carlos Alfredo Rios Perez to expand the January program, during which students conceived three solutions to address environmental problems in Madre del Dios. After consulting local non-governmental organizations, Vlassak and Perez selected the soil-testing device for further development. In Lima, Huggins, Zhang, and the UTEC engineering students created a spectrometry device to analyze the phosphorus level in soil. Phosphorus is essential for agriculture because it helps plants utilize nutrients. 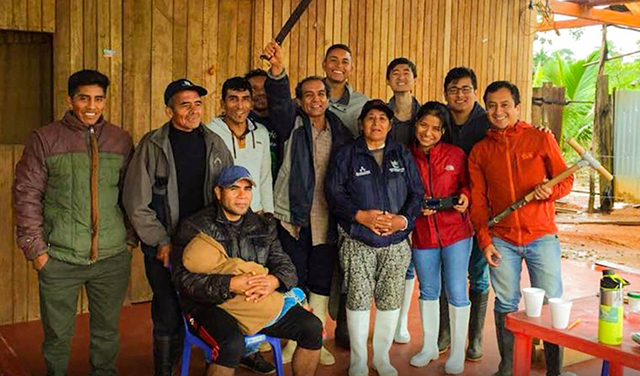 The students took their prototype to Madre del Dios, where they gathered feedback from farmers and learned about the challenges of integrating the device into agricultural processes that have been ingrained into the culture for generations. The farmers were enthusiastic about the prototype, Huggins said, but implementing the device widely could be very difficult since the chemicals used in the soil test are costly and require special permits in Peru. 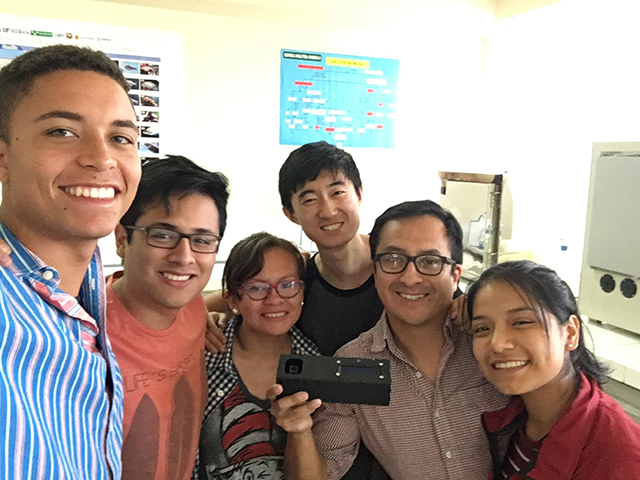 In Peru, the students from SEAS and UTEC collaborated to develop this soil-testing spectrometry device, being held by UTEC engineering professor Carlos Alfredo Rios Perez. 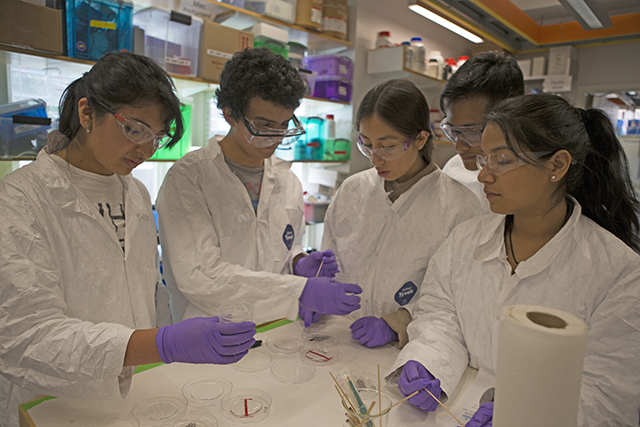 To overcome this challenge, Huggins and the UTEC students traveled to Cambridge, where they collaborated in the SEAS Active Learning Labs to develop a microfluidic device that could perform the same soil analysis. Microfluidic tests use only a few drops of chemicals, reducing the cost of the device and making it easier to implement. As the team carefully conducted chemical tests, Jose Martin Paredes Santus, a UTEC senior majoring in industrial engineering, said it was challenging to combine chemistry, with which he is less familiar, with physics and math. Working with cutting-edge equipment at SEAS was a great learning experience for Elena Ezquerra, a UTEC senior majoring in energy engineering. She enjoyed collaborating with her peers on a project that could actually make a difference. Moving forward, Vlassak is working to have the microfluidic device incorporated into a senior thesis project, enlisting an engineering student to refine the device, develop additional chemical tests, and prepare it to be deployed in the Amazon. A team of students at UTEC may continue developing additional spectrometry devices for other soil tests. The SEAS/UTEC collaboration, now in its fifth year, is a unique way to give students real-world engineering experience, said Vlassak. The students met with farmers in Madre del Dios to learn about the agricultural challenges they face and how their device could be utilized most effectively. For Huggins, the prospect of implementing a solution to help people in need is inspiring, and something he hopes to continue in his career as an engineer.